Are you starting out in electronics? Then these simple electronic circuits will make it easy for you to start building electronic circuits. Well, I decided to make it easy for you. 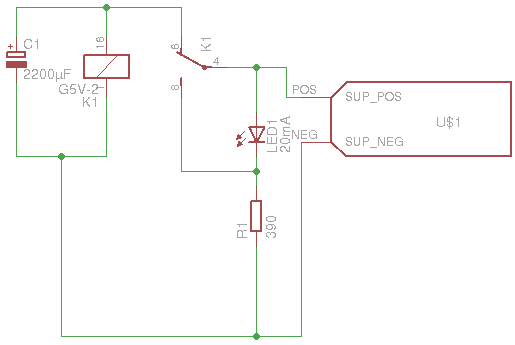 For each of the three simple circuits I provide a description, a schematic (Eagle), PCB design (Eagle) and even Gerber files that you can download. 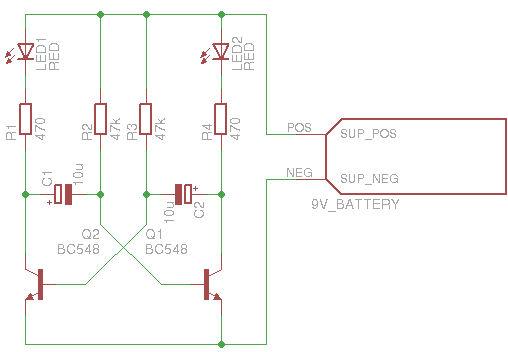 This way you can choose if you want to start from scratch, start from schematics, start from finished PCB design or just download the Gerber files and get the circuit built. The first of the simple electronic circuits is this little fella. It has a battery holder, a couple of resistors and six light emitting diodes (LEDs). 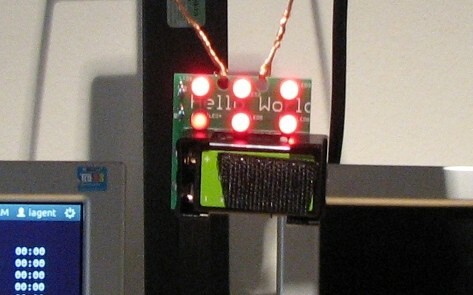 The reason I call it “Hello World” is because when you turn the power on, the LEDs light up the words “Hello World” written on the PCB layout I have created. Note: The “Hello World!” text was designed to fit the 5cm x 5cm board perfectly, but the PCB manufacturers doesn’t always support the text size you have chosen. Look at the picture below. On the PCB I ordered from Seeed Studio the text was made larger and thereby it did not fit on the board. This is the solid-state version (no moving parts) of the blinking LED circuit. I think it is the coolest of these simple electronic circuits. The size of the capacitors C1 and C2 dictates how fast the two LEDs will blink. The resistors R1 and R4 limits the current for the LEDs while R2 and R3 limits the current for the transistor. The BC548 transistor is a NPN transistor which is very, very common and you should be able to find it everywhere they sell electronics parts. A common mistake when soldering this electronic circuit is to swap R1/R4 with R2/R3. So if you solder this and it doesn’t work, check that you have the resistors in their correct place. When I started learning about electronics I had a hard time understanding how to blink a light. My father explained it to me using a relay, a capacitor and a small light bulb. This circuit is much easier to understand than the blinking LED circuit using transistors. The relay is powered through its own NC (Normally Closed) switch. The same is the LED. So when the circuit is powered up, the LED will lit up and the capacitor starts charging. When the voltage over the capacitor is high enough, the relay pulls the switch into its NO (Normally Open) position. This means that the capacitor starts discharging and the LED is turned OFF. The voltage starts dropping on the relay coil and when it is low enough, the switch is released into its NC state. And the process is repeated. Wanna Build More Than Just Simple Electronic Circuits? Even though I recommend starting from scratch when you build one of these simple electronic circuits, I understand that sometimes you want to be safe. So feel free to download the Gerber files and just get them produced instead if you feel like it. in your blog post, How I Learned The Flashing Light Circuit, this is exactly where I’m looking to start with electronics. my question is in your story , you have no mention of volts and how do you know if your components will all work together and if they didn’t, which component is giving you the problem. That is my issue right now. I’m sure by trial and error i can get the circuit to work, but if i want to have a bigger light, how to know what parts need to change? When I built that circuit, I had no idea about volts or if components fitted together. I did some trial and error, and with the help of my dad I made it work. To understand more about what’s going on, you need to learn a bit more about vopltage, current and resistance, and how to basic components work. hey,i am in Nigeria and we don’t have electronic shops selling these components. this is my major problem. pls help me. I really liked your blog and i have gathered a lot of knowledge from here, i want to make a ultrasonic humidifier using piezo electric disc, that has a frequency of either 2.4 or 1.7 mega hertz, can you please help me, in designing a circuit that can generate the same frequency.